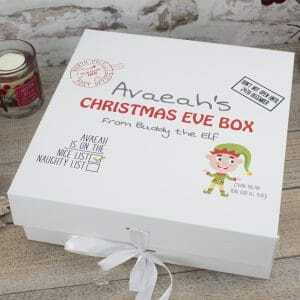 Spark some excitement into your Christmas Eve and make sure your little one is all prepared for the arrival of Santa with their very own personalised Christmas Eve box - a magical way for every child to prepare for the big day. Heavensent baby Gifts originally designed its Royal Range to celebrate the birth of HRH Prince George but it has proved so popular we have continued with the gift set. This Royal baby blanket and personalised comforter is the perfect way to celebrate the little Prince in your life! Heavensent baby Gifts originally designed its Royal Range to celebrate the birth of HRH Prince George but it has proved so popular we have continued with the gift set. 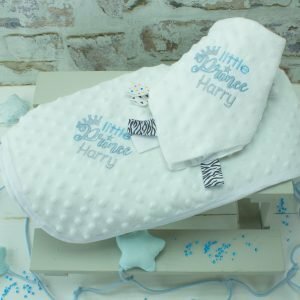 This Royal baby blanket and personalised comforter is the perfect way to celebrate the little Princess in your life... to personalise simply type their name into the Personalisation box! Are you looking for a gift that's super cute yet practical? Look no further than our 'Sleep & Eat' gift set, that includes a sleepsuit, bib and adorable hat, practical for both meal and bedtimes that can be personalised for that adorable extra touch! 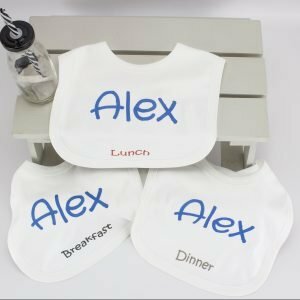 Our three pack of cotton bibs will make a stylish addition to every little ones feeding time wardrobe that can be personalised to ensure baby has their very own bib for every meal! Our beautiful in house designed "good things come in small sizes" gift set will keep your little one nice and warm at nap time with our 100% cotton bodysuit and fluffy towel. Also available in white and blue! This deluxe bouquet is exquisite, great to take to hospitals where real flowers are not allowed and they wonât wilt and die. his gift includes; 2 personalised bibs, a personalised bodysuit & wash cloth. Introducing Heavensent's uniquely designed children's nursery rhyme and personalised bib set, both practical for any little accidents baby may have and a perfect gift to remind you how precious they are everyday! This embroidered baby bib is available in boys, girls and unisex colours making them a great gift for baby showers and newborns! Brighten up your baby girls bath time with our adorable Bath Time Gift set, that includes a Personalised Hooded Towel to keep her dry, a Personalised Dressing Gown to keep her super cosy & Personalised Baby Gift Box! Whether it's playtime, nap time or feeding time this baby clothes set has you covered, this delightful gift set includes a personalised baby sleepsuit, baby bodysuit & baby bib. 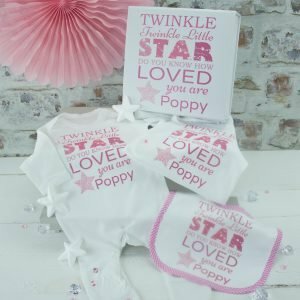 This charming set includes the famous nursery rhyme "twinkle twinkle little star" alongside your baby girls name for a truly memorable keepsake! Whether it's nap time, feeding time or playtime this baby clothes set has you covered, this charming gift set features a personalised baby sleepsuit, baby bodysuit & baby bib. This gift set also includes an exclusive Personalised Baby Keepsake box, the ideal storage place for all their early years memento's! This adorable set includes the famous nursery rhyme "twinkle twinkle little star" alongside your baby girls name for a truly memorable keepsake! Our adorable Personalised 'HRH' bodysuit is sure to make your very own beautiful little Prince or Princess looking like royalty, made from 100% soft white cotton making both comfortable for your baby girl and durable from Mum & Dad!